We are a friendly and affordable salon located on Inverkeithing High Street, offering a range of services to Ladies, Gents and Children. We offer a range of cut and colour services for ladies. We offer a Gents cut or clipper cut. We offer Gel Polishes in a amazing range of colours. 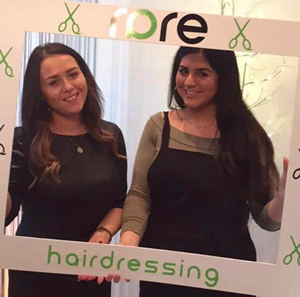 Lana and Amy are both senior stylists with over ten years experience each. We first met as apprentice hairdressers and have been friends since. At Rare we specialise in all aspects of cutting and colouring for ladies, gents and children. Thank you so much my hair is lovely and I have loads more confidence now. I will be back again you were really patient with me Amy. Thank you 10 out of 10! This was first my time in the salon and it won't be my last. Both the girls were fab. I left loving my hair, my nails and feeling great! Reviving this gorgeous balayage for this lovely gal! Beaut! Outgrown hi-lights to a half head hi-lights! Beautiful clean blonde. Love! Gorgeous hilights! Going lighter for spring/summer! Includes colour or hi/lights, conditioning treatment plus a cut and finish plus a gel polish.